The Trust has recently received another generous donation to add to its collection of books on Iran, owned previously by Sir Roger Stevens (1906-1980), former British ambassador to Iran. Sir Roger went to Iran in 1954 as Britain’s first ambassador after a two year break —the result of nationalization of the oil industry— and played a key role in rebuilding diplomatic relations. Although he served there for only four years, his enthusiasm for the people, art and history of Iran never left him. His main work was The Land of the Great Sophy (1962), but he also wrote on European travellers in Persia and other related subjects. 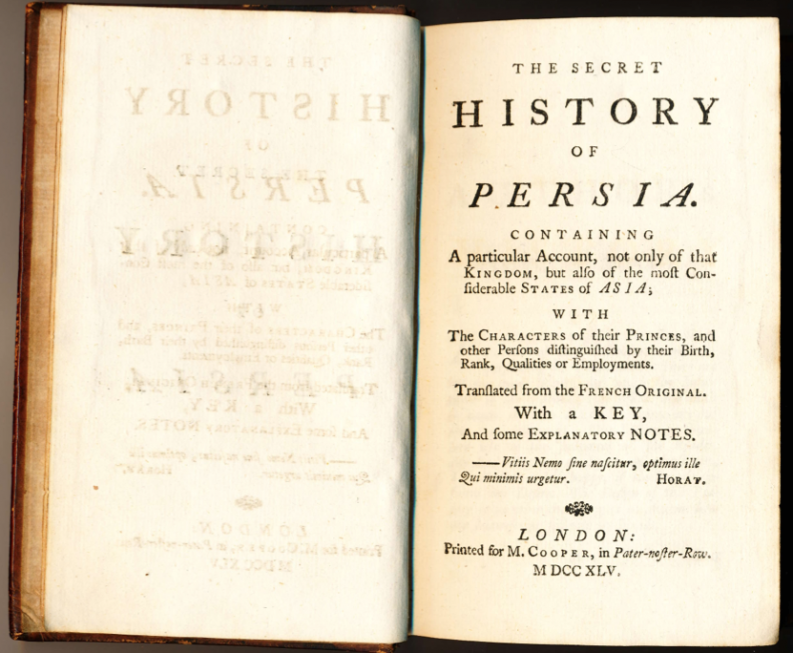 The newly acquired title is The Secret History of Persia…a 1745, leather-bound translation from the French original ‘Memoires secrets pour servir à l’histoire de Perse’, a political satire on France, variously attributed to Antoine Pecquet and Madame de Vieux-Maisons. The 12º (duodecimo) edition includes the rather effusive sub-title : ‘containing a particular account, not only of that Kingdom, but also of the most considerable states of Asia; with the characters of their princes, and other persons distinguished by their birth, rank, qualities or employments’. This edition will be added to the original collection of 63 titles, which dates from the early 1950s onwards and consists mostly of travel and art books. Please see Sir Roger Stevens’ books to view a pdf listing of his donated books in the AIIT library. Sir Roger’s papers, including his correspondence and papers on Iran, were deposited in the Churchill Archives Centre by his widow, Lady Stevens, in 1984 (see http://janus.lib.cam.ac.uk).